Can other pieces capture a threatening piece and prevent a checkmate? If I were playing black, I know I cannot capture the pawn with the king, as I would placing my king in check. But: Why can't I use the rook or the queen (right next to the threatening pawn) to capture the pawn and get out of the check? Keep the king where it is. Use the rook to capture the threatening pawn. 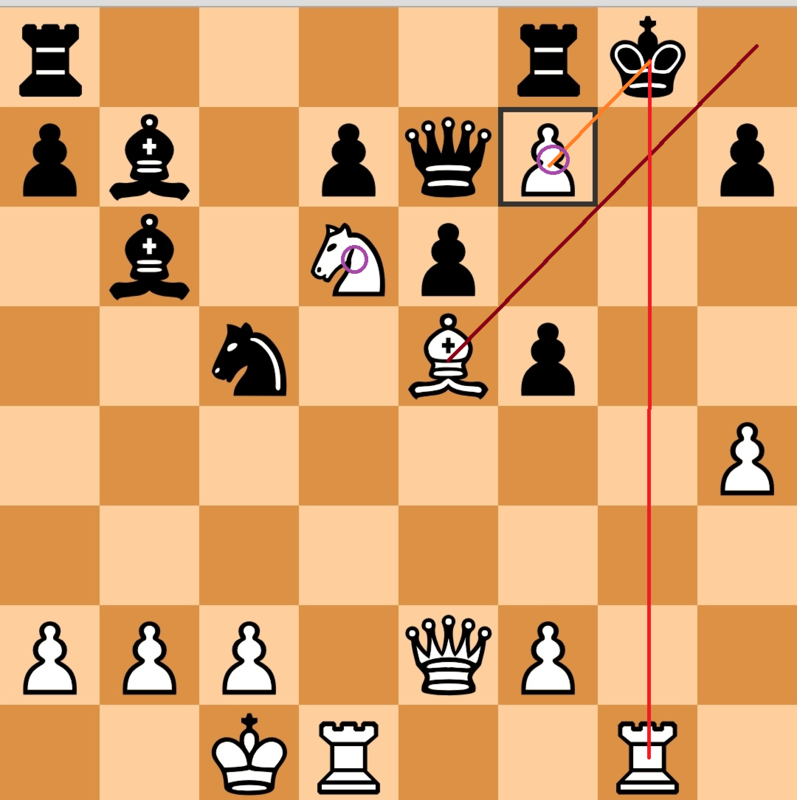 Yes, you can capture the attacking piece with any one of your pieces, as long as you get out of the check. But in this case, the king is also attacked by the rook. So, you are checkmate. This is called a double check. You're checked by both the pawn and the rook. Blocking, or capturing with a piece other than the king would only deal with one of those problems, so the only ways to deal with double check are to capture with the king (which you can't, here, because the pawn is protected) or to move the king some other way (which you can't, because both squares you could move to are covered by the bishop). Double checks are very powerful, because they can only be dealt with by moving the king, and you don't have to cover much to prevent the king from being able to do that. The pawn - The black king is currently in check by the white pawn on the diagonal. The king would need to move away, or the pawn be taken to remove this. The rook - The black king is in check because of the white rook at the bottom of the same column. The king would have to move out of that column, another piece would need to block, or the rook be taken to remove that check. The bishop - The black king can't move into the corner to get out of check because the white bishop is threatening that square. The knight - The black king can't take the pawn to get out of check by the rook and pawn because the knight is threatening that square. There's no single move here that will get the king out of check. If the pawn is taken by another piece, the rook is still holding the king in check. If the king moves to the corner, out of check by the rook and pawn, he is now in check by the bishop and if the king takes the pawn, moving out of check from the rook at the same time he is in check by the knight. There are two checks here (pawn and rook). If the king runs to either empty square, the bishop (and in one case, the rook) can capture. If the king captures the pawn, the knight can capture. That takes away #1. You can block the rook check (with the queen or bishop) but not the pawn check. That takes care of #2. You can capture the pawn (with the rook or queen or king), but you can't capture the rook, so that takes care of #3. If the white pawn wasn't checking, or if the white knight couldn't recapture, it wouldn't be checkmate (you could block the check or take the pawn with the king). If the white rook wasn't checking, it wouldn't be checkmate (take the pawn with the rook or queen). It takes both checks in this case to produce checkmate. This is a rather complicated checkmate. In my experience, most beginners would not be able to understand it, nor would they be able to find the move that produced it (the pawn capturing something to give check, which also produces a discovered check with the rook). Don't give up on the game because the app gave you a rather nasty position. Most real life chess is simpler than that. For total beginners, it may be best to play chess without checks and just play to capture the king. Whoever captures the king first wins, even if your king is being threatened. I say this because it is difficult to understand check at first and playing until the king is dead is the same as playing chess regularly, except if you were to miss a move that kills the king or someone accidentally puts themselves into check on their move. In this case, there is no place the king can go or capture that won't be captured next move. King takes pawn, knight takes king. King moves to long black diagonal, bishop takes king, Something else attacks pawn, rook takes king. Something blocks rook, pawn takes king. Is it possible to position all chess pieces on the board such that all pieces defend at least one piece and attack at least one piece? Can a king capture an opposing queen? Can a pawn move to the last line in chess as part of a promotion even if the square is blocked by an opponent's piece? What is the appropriate way to snipe a king that castles through check? What is this game, played with chess board and pieces, but with totally different rules? Chesscademy exercise: material part 2 - why doesn't this move result in a 2 point material lead? Are there any chess sets with more than 32 pieces? In chess, how many times can a piece be attacked at once?